The Guest Access feature of the Linksys Smart Wi-Fi Routers and Linksys Velop allows guests to use your internet connection without granting access to your files and other devices connected to your main network. In short, your friends can visit different websites but will not be able to access printers or any shared files in your home computers. When you initially set up your router, a secure Guest Network is also created on the router. 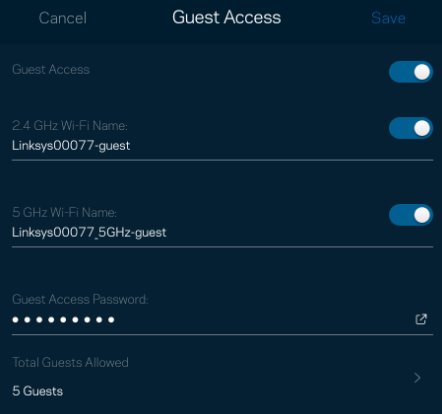 The steps below will guide you on how to configure the Guest Access feature using the Linksys app on your mobile device. NOTE: In this article, an Android™ mobile device is used. Access your Linksys cloud account using a mobile device. For instructions, click here. Tap the Menu icon across the top left side of the screen. Toggle the switch to the ON position to enable Guest Access. This will allow guests in your home to access the internet using the Guest Network. NOTE: To disable Guest Access, simply toggle the switch to the OFF position. Tap the 2.4 GHz or 5 GHz Wi-Fi Name field to change the Name and Password for your Guest Network. You can also disable / enable the 2.4 GHz or 5 GHz Guest Network by toggling the switch. 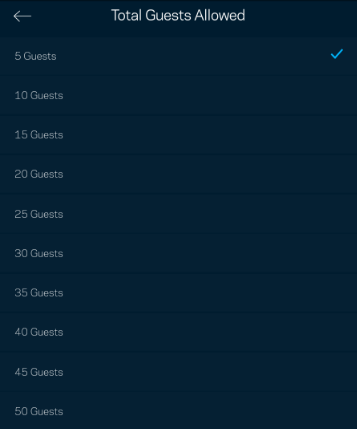 To change the number of guests who can connect to your Guest Network, tap on Total Guests Allowed and select from the list. NOTE: The number of guests allowed is set to 5 Guests by default, but you can set it up to the maximum of 50 guests. Tap Save to apply the changes. Tap the Share icon to share your Guest Network settings. Tap the Guest Network you want to share. QUICK TIP: You can share your Guest Network settings via text message or email. You can also Copy the settings so you can share it manually through other channels.